This first parameter was added when RegisterClass() was upgraded to the newer RegisterClassEx(). 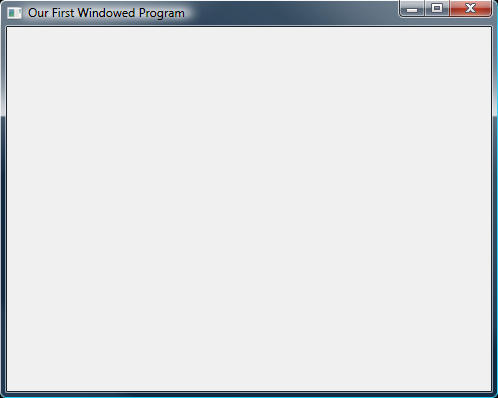 It is an extention of the fourth parameter, dwStyle, and simply adds more options for the window style. We won't cover any of them here, but they can be seen in the MSDN Library under CreateWindowEx(). We will set this value to NULL to indicate this. TranslateMessage() is a function that translates certain key-presses into the proper format. We will not go into this in too much detail, as we will mostly use DirectInput for our keystrokes, and this bypasses the Windows message system. Its single parameter is filled with address of our msg struct. When a message enters WindowProc, we can use the uMsg argument to determine what message it is. Many programmers, and all game programmers I know, use a switch() statement to determine the message. Here is an example of how you might do this (it's how we do it in our program).